The details on the Chuzzlewit web site are sketchy, but I gather that this is a solo project from a fellow named Greg who is from St Paul, Minnesota, but since beginning Chuzzlewit in 1995 has been variously located in Indiana, Chicago and St. Louis. Sub-titled Unreleased Recordings 1995-1999, Palimpsestial is a collection of spacey melodic songs. Greg's songs are less "catchy" than they are dreamily drifting and just downright pleasant. The guitar, keys and vocals are simplistic, yet oh so effective, the strength being in the combination of atmosphere and melodic brain massage. Among the highlights is "Observatory Walk", which combines dreamy shoegazer dream-pop and soundscape drones. So we've got this nice spacey drifting song, but made all the more interesting by the atmospherics and loop efx. And speaking of efx, there are some cool trippy alien swirls, and even what sounds like a mellotron in the background on "Tunnel Vision". "Efficiency" and "Trinkets" are good tunes that have more of a Rock edge than most of the other tracks. Chuzzlewit gets more complex and even a bit avant-garde on "Her Eyes Are The Color Of", which combines the dreamy elements with drone waves and rapid paced rhythms. "Travelling Fox" includes seductive wailing notes that I enjoyed. "In Silver Streets" brings in a female vocalist to very nicely compliment Greg's singing (I'm assuming this is Rachel that he refers to on his web site). The song is also surrounded by a beautiful cosmic aura, along with guitar and percussion patterns that make for an interesting contrast with the principle melody. Overall, an enjoyable collection of songs. 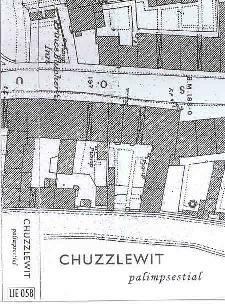 For more information you can visit the Chuzzlewit web site at: http://www.chuzzlewit.net. Palimpsestial is distributed by Best Kept Secret. You can visit their web site at: http://www.indiepages.com/bestkeptsecret.